Create the bathroom of your dreams with an inexpensive bathroom makeover. You can refresh your bathroom in a weekend or less with these 5 affordable upgrades ideas. I know everyone at the moment is on the #hincharmy, Mrs Hinch hype. However giving your bathroom a deep clean can really make your bathroom look much fresher. What is the difference between regular cleaning and a deep clean? Regular cleaning is what most people do on a regular basis for example weekly vs a deep clean which is every 6 months to a year. Deep cleaning the bathroom means cleaning the inside and tops of the cupboards, including cabinets, underneath and behind the sink and toilet and removing built up limescale from all taps, tiles and the shower head. A coat of paint on the walls and ceiling is the easiest way to freshen up your bathroom. Lighter colours will make the bathroom seem larger or if you are after something a little more cosy, go for a rich dark colour. Make sure you use bathroom paint as they are especially designed for wet areas. You will have less issues with mould and a more hard wearing finish. A bit of greenly can do wonders for a look of a bathroom. Invest in some moisture loving plants like ferns and orchids. Not only will they love the steam from the bathroom they will also add some scent to the room. Another way of giving your bathroom a fresh and modern look is by changing the tiles. If your budget is tight you don't have to tile your whole bathroom. Simply changing the tiles around the sink will make a huge different to the look and feel of your bathroom. 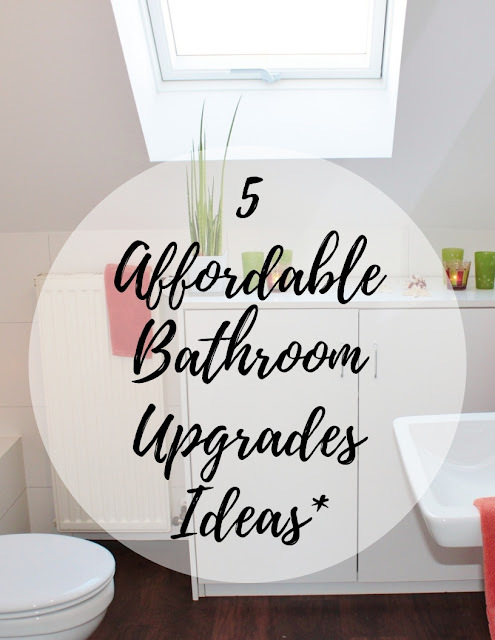 So those are my 5 affordable bathroom upgrades ideas. If you need more design inspiration for your bathroom. Visit showrooms like Harrogate bathroom for classy ideas and bathroom ideas. I find visiting showrooms give you more of an idea how things will look once installed.